Join our list and get 5 free video / tab downloads! We’ve traditionally been taught that instrument technique practice is about repeating things correctly until the movements sink in. But it’s hard to do that when you don’t know how to do the movement correctly in the first place. That’s never more true than with crosspicking technique. 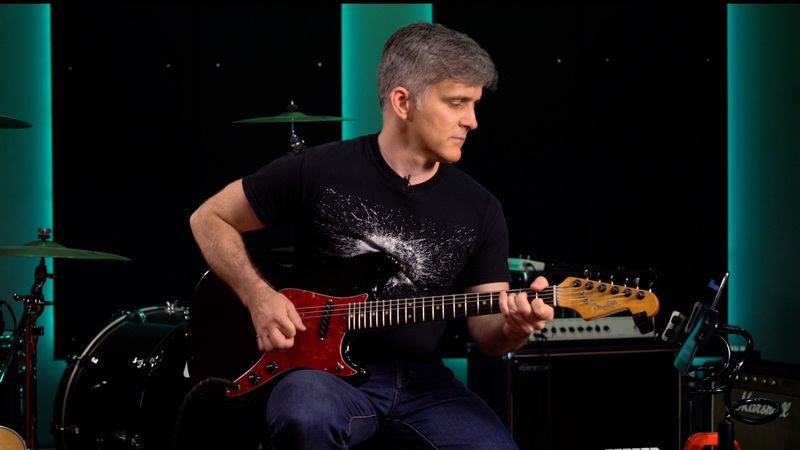 If you’ve ever sat down to try and alternate pick an arpeggio, you probably know that the ability to do this slowly with note-for-note accuracy doesn’t always translate into the ability to do the same thing quickly. Lots of us, myself included, hit a speed limit the first few hundred (cough, a thousand, cough) times we tried this. Despite the accepted wisdom about slowness and correctness, that speed limit never really improved by piling on the repetitions. That’s because efficient one-note-per-string alternate picking has specific mechanical requirements, namely that the muscle chain used for the downstroke must not overlap with that of the upstroke. If it does, you’ll hit that speed limit, and your arm will venture quickly into repetitive strain territory as it performs twice the work it’s used to doing. 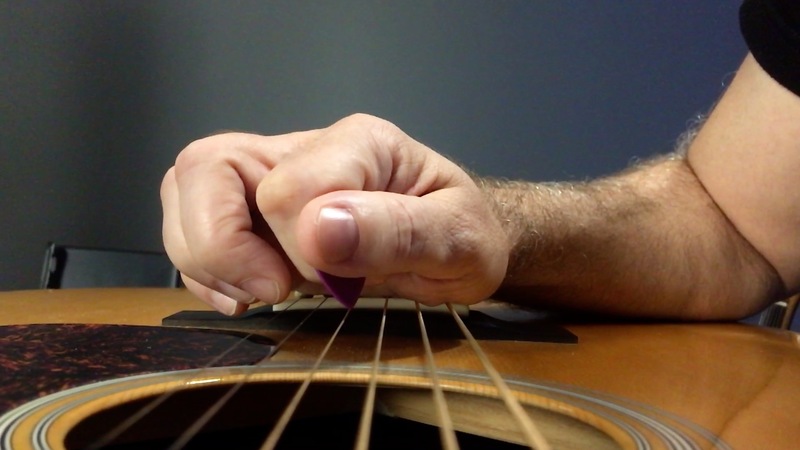 In a sense, this type of muscle reuse, which we call “stringhopping”, is not even really alternate picking, because the mechanics of your picking hand aren’t fully alternating. Instead, what you need to solve the puzzle of crosspicking is a tilted forearm, so that when you’re targeting a particular string, the pick can approach it on an angle, and also leave it at the opposite angle. Like a barnstorming biplane, you’re essentially swooping in to hit the strings and launching back out again just in time. The trick is that the optimal method for achieving this curved trajectory is so mechanically efficient that when done properly, it’s hard to perceive that you’re even doing it. Very often, great crosspickers aren’t even aware either. On the one hand, this raises the question of how we’re supposed to learn something if elite players only do it subconsciously. On the other hand, this bit of information tells us something important that we can actually use. It tells us that the end result, however we get there, must feel invisible. In other words, we can use this feeling of effortlessness as a test to see if the motions we’re practicing are actually working the way they’re supposed to. If they’re not, we can change our approach and try again. This is the crux of the kind of intuitive trial-and-error practice that works best for motor learning. A cool way you can attack this is something we stumbled upon by accident during a filming session. While looking for a convenient way to get a good closeup view of crosspicking technique, we placed the guitar on its back on a monitor stand at about chest height. This made it easy to line up the camera at the exact height where it contacted the strings. Oddly, this approach was even easier than the typical seated playing position. Why it would be any different wasn’t initially clear. After all, my arm position hadn’t changed, I just placed the guitar horizontally and contacted it the same way I always do. As you can see in the clip, the hand contacts the string in a more or less typical fashion. But after thinking about this further, we realized that appearances can be deceiving. A forearm orientation that would be supinated in playing position is actually highly pronated in laptop position. Relative to the strings, it is still supinated – which is why it looks the same under the camera. But when you turn your guitar 90 degrees with your arm attached to its typical anchor position, it only makes sense that your arm must also turn. Lucky for you, your forearm was designed to make precisely this kind of rotational movement. So it’s a happy accident that it can do so and still maintain a functional picking position. This works so well that you can go from your typical playing position, to your lap, and back again, and you really cannot feel the arm rotating while you do this. But take away the guitar in laptop orientation and look at your forearm, and you’ll see that it has actually rotated to a motorcyle handlebar-style grip. Why does this motorcycle orientation make the crosspicking movement easier? Unclear. With the arm resting on the guitar top, your forearm makes easy and tension-free contact with the instrument. Your wrist rests comfortably on the bridge and strings. So you’ve removed the need to hold it in place. You have gravity working with you to maintain this setup. The whole arrangement feels like having your arm resting on a desk or table top. Once you’ve achieved this orientation, the only sensation you need to focus on is the left and right movement of the picking motion itself. As you can see in the closeup slow motion view, the technique has a vertical component to it which allows the pick to clear the strings, barnstorming style. However because of the efficiently alternating nature of the muscle chain, it looks much more noticeable than it feels to do it. In the mean time, if you’d like to experiment with this, mimic the form in the clips above and see if you can get the leftward and rightward motion of crosspicking happening. Don’t do this slowly. Instead, just go for it at a faster speed until you feel something that feels like, well, not much! The first step is focusing on motion feel, and not note-for-note correctness. It’s ok if you hit ringing strings or even multiple strings. If it feels smooth and fast, and the motion appears somewhat semicircular in a mirror or on video, then you’re on the right track. Super helpful Troy, definitely like this method. I wonder what the research is on motor learning and perspective shifts. Found this on Noa’s site. This is a great finding Noa is pointing out here and typical of the kind of suprising things you find when you start reading motor learning papers. However according to the study this effect only works if you can actually do the target motion first. Basically you learn it, then undo it a little, the re-learn it with these variations applied. In the case of crosspicking we’re looking at something that most people can’t really do at all. So if they can suddenly do it in the lap orientation I would suggest something a little more prosaic is going on. I just think the lap approach positions your hand in pretty much the right setup which you would otherwise have to discover and maybe not get right. Plus it requires no effort to maintain that form. You’re just resting there on the guitar. All you have to do is move left and right. Of course being comfortable is one thing and being able to really do the motion is another. Let’s see some video clips! Couple of things about the “feel” of doing this. I stumbled into it decades ago and have since lost and found it multiple times. The finding it had to do with realizing that with certain players I admired (Hendrix, SRV), there seemed to be such a perfect continuity between strumming and single note playing, and so I was trying to figure out how to make that happen. My guide in doing it was a particular feel the pick had in contacting the strings that sent a “this feels right!” signal to my brain. A kind of “straightness” in the up-picking direction and more of an angled contact in the downward, but both producing a kind of “ping” in the attack. And suddenly I’d get that light, easy “strummy” feeling even when playing single-note runs, pentatonics particularly. Without a better analytical framework it was hard to hold onto though. Where I tend to lose it is when I try to maintain it in other situations–multiple NPS runs and the like. You’re demonstrating it as strictly a SNPS arpeggio technique, which is huge, but I’d like to hear anything you have to say about the transition to more “dense” figures. Anyway, I finally have a free day off–gonna spend a couple of hours trying the dobro position out! I actually learned how to crosspick just by watching Molly’s motion mechanics when they were published on th site. Yes, it was something that was buried in my motor memory, something i had learned and forgotten. The “feel” of crosspicking makes me think of a fish swimming up a river. This should help you know when you get it. Serendipitously, my brother had the opportunity to engineer on one of Molly’s recent live recordings just a few weeks ago. She’s amazing. © 2019 Cracking the Code. Anything we can help with?